I’m trying to put this thing into a position where I can really test it out but basically it’s a wireless hard drive. 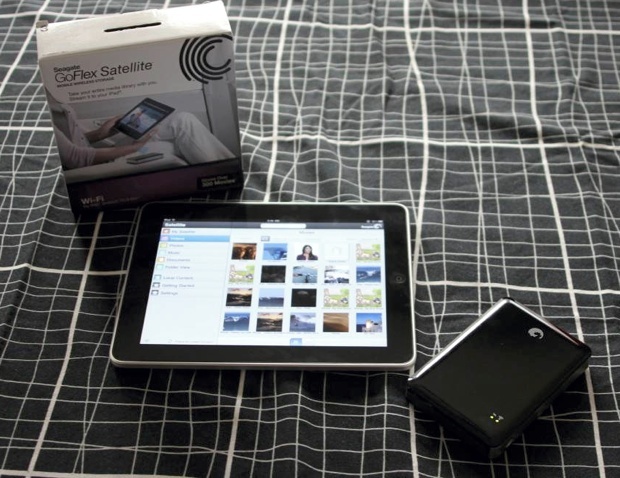 It’s called the Seagate GoFlex Satellite and it contains a small battery, a 802.11g/n radio, and a 500GB hard drive. To use it, you connect it to a data source – your computer, NAS, etc. – and drag over files you might want to use or share with others. Then, while you’re on the road (in a plane or car or office) and you can’t connect via USB (or don’t want to) you turn on the device, connect to it via the built-in WiFi hotspot, and browse the files using a web or iOS app interface. You can also download files from the drive and then turn it off, thereby saving the battery. The drive uses Seagate’s GoFlex cable interface which means it runs at USB 3.0 and can be up or downgraded to various standards using add-on cables (sold separately). A small cover protects the back port when you don’t need a cable. It costs $200 and will be available in July. The question, then, is “Why?” While I don’t like cluttering up my iPad any more than the next guy, I wonder if I really need up to 300 movies with me on the go. However, as a hyperlocal sharing system – up to five people can connect at a time – it may be useful in that it allows you and your closest friends to stream different files from the same drive at once. Think of it as an odd, virtual video jukebox for five people. Again, I need to take this on a flight to see if I’m really in love with it and I’ll be on my way to Vegas and then E3 in a week or so, allowing me to test it in its native habitat. Until then, it’s a really cool idea but I’m worried about the use cases the average user will find after purchasing it. Another interesting point – it only supports NTFS so you have to install a plug-in under OS X to run it. It runs a mini version of Linux so I won’t be surprised if folks don’t hack it in the next few months.